This year I have been thinking about pumpkin desserts that are not your standard pie or bread. Don’t get me wrong, those desserts are all wonderful and I will be having at least one of them on our holiday table, but this year I wanted to shake things up. I am helping my mom with her dinner on Thanksgiving Day, and then the next day I will be going out to my in-laws for a second Thanksgiving dinner. Where my mom is full-on traditional turkey feast my mother-in-law is not. Part of that is her immigrant heritage, she is originally from Taiwan, and the other part is her individual taste. She is not a fan of turkey, dressing, or plain old pumpkin pie. In a way these bars were inspired by her. They have an element of tradition dressed up in a fun new way! I decided to go with a blondie because they are a particular favorite of mine, and they are great for sharing, giving, and transporting. For extra flavor, and because I like then so much, I added some mashed bananas. 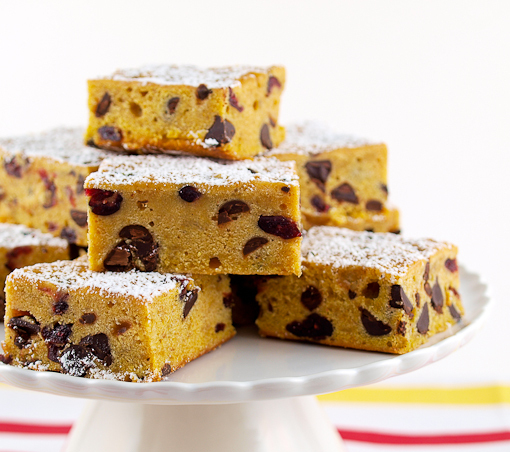 They provide extra sweetness, flavor, and a lot of moisture. 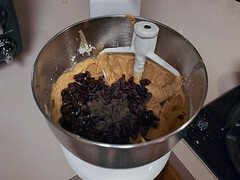 I also added some dark chocolate chips and dried cranberries. 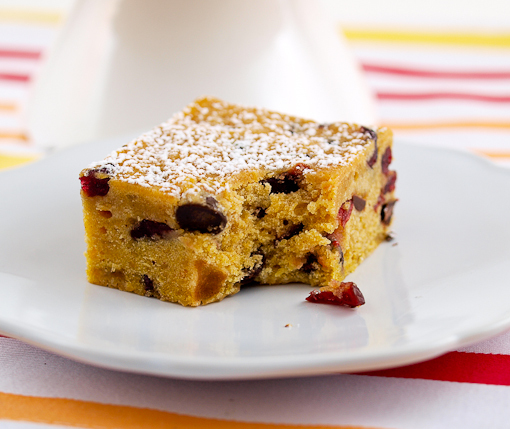 The former because I am always looking to add more chocolate to my life, the latter because they are seasonal and they add a little refreshing tangy sweetness to these bars. 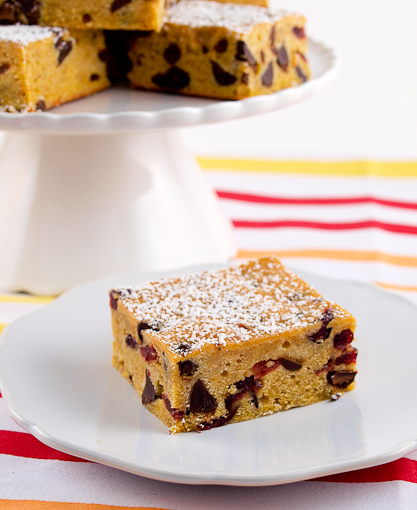 That little tangy bite keeps these blondies from feeling too heavy. This recipe shakes, rattles, and rolls tradition in the best possible way! 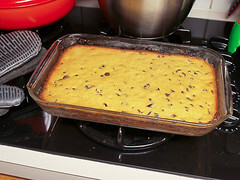 Heat the oven top 350 F and spray a 9 x 13- inch baking pan with non-stick cooking spray. 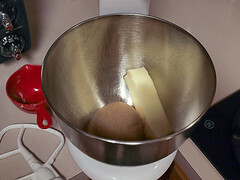 In the bowl of a stand mixer fitted with the paddle attachment, or in a large bowl with an electric mixer, cream together the butter and sugar until smooth and creamy, but not fluffy. Add the vanilla, then the eggs one at a time until well combined. 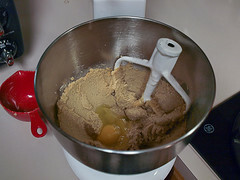 Turn the mixer to medium-high and beat until lighter in color, about two minutes. 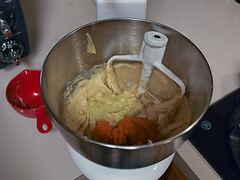 Add the banana and pumpkin and mix until blended. 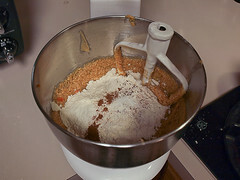 The mixture may look broken at this point, but that is ok.
Add the flour, salt, cinnamon, and nutmeg and mix until just combined then add the chocolate chips and dry cranberries and fold in. 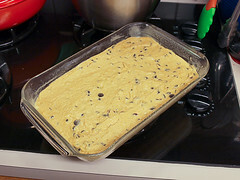 Spread the mixture into the prepared pan and bake for 25 to 30 minutes, or until the center of the blondies feels firm when gently pressed and the top is golden brown. Cool completely in the pan before slicing, about 1 hour. 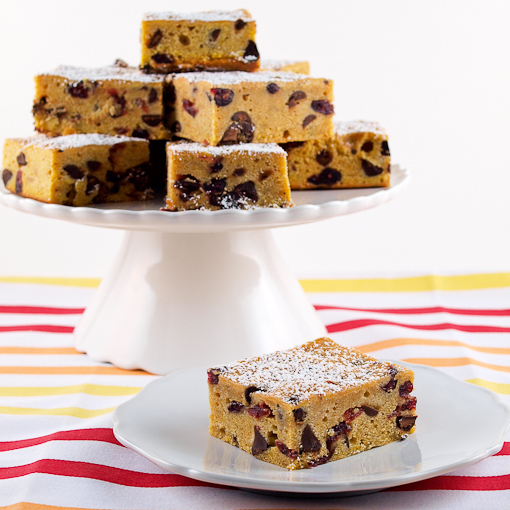 Dust the bars with powdered sugar, if desired, and enjoy!